Under the Affordable Care Act, those health systems that invest their community benefit dollars strategically will be the market leaders. Addressing the social and environmental factors (beyond improved care coordination) that are obstacles to positive health behaviors produces substantial change in health status including reduction in readmissions and preventable hospitalizations. Building shared ownership for health among diverse community stakeholders becomes increasingly important in order to address the issues that produce preventable conditions causing poor health. The National Leadership Academy for Community Health Improvement (NLACHI) is a new program that addresses this urgent need for Community Benefit (CB) leaders who are skilled in systems change perspectives and multi-sector collaboration. NLACHI will build advanced skills for Hospital Community Benefit leaders, advancing their leadership knowledge, attitudes and practices, and accelerate the impact of hospital Community Benefit investments. Participation will support CB leaders to build and strengthen the skills necessary to help move this ambitious undertaking with focus on effective partnerships and results. In addition, NLACHI offers support for the development of a cohesive strategy for building your organization’s mission and vision, working to protect its IRS status and building responsible, accountable stewardship for management of your organization’s considerable investment in community benefit. NLACHI is based on the highly successful National Leadership Academy for the Public’s Health (NLAPH), funded by the Centers for Disease Control and Prevention (CDC), rigorously evaluated and proven to increase the professional expertise and capacity of teams that often include CB leaders. The National Leadership Academy for Community Health Improvement (NLACHI) is now accepting registrations for the 2015-2017 Session! For more information please see the NLACHI Summary. Community Benefit leaders who are responsible to a nonprofit hospital for Community Benefit programming are the primary audience. CB leaders may register individually, with a team of community partners, as a group of CB leaders within a hospital system or as a team of CB leaders from different hospitals located within a defined geographic region. Click on the NLACHI 2015 Participation Options Diagram for a detailed break down of the options for participation in relation to applicant types, fees, project, structure, activities, and learning methodology. Individual and team leadership mastery. Sharing ownership for health across sectors. Using data for Community Health Improvement (CHI) assessment, planning and evaluation. Applying a systems model for CHI. Participants agree to design and work on an Applied Health Leadership Project (AHLP) that moves the hospital's Community Benefit Plan into better alignment with their community needs assessment. The AHLP, which should be designed to complement the Community Benefit leader's actual work responsibilities, is an experiential learning opportunity that serves as the vehicle to further develop and hone leadership skills. An ideal AHLP takes a new approach to improving population health by engaging non-traditional partners from other sectors to create unique solutions for those challenges. All participants must commit to 100+ hours over the 18-month program and attend two retreats preceding ACHI's Annual Meeting held in March 2016 and March 2017 at the ACHI Meeting location. Tools - NLAPH utilizes a number of custom based tools that teams engage with at different points during the year. The Big Picture© creates a one-page overview of the teams' Applied Health Leadership Project (AHLP) and is the fundamental tool for planning and executing the years’ activities. The Network Map offers a brainstorming opportunity regarding network building and partnership required for the work. Got Data© partners with the Big Picture© and goes deeper in developing outcomes and indicators and prompting CQI opportunity throughout the year. Framing the Message© walks through the process of explaining the CB Leader’s key messages and how those might be adapted for different audiences (it also builds directly off of a program webinar). Finally, the Culminating Report© walks Participants through sharing their journey during the NLACHI experience - where they started, what impacts were made, and what was learned along the way in their CB portfolio, AHLP project and in leadership learning. 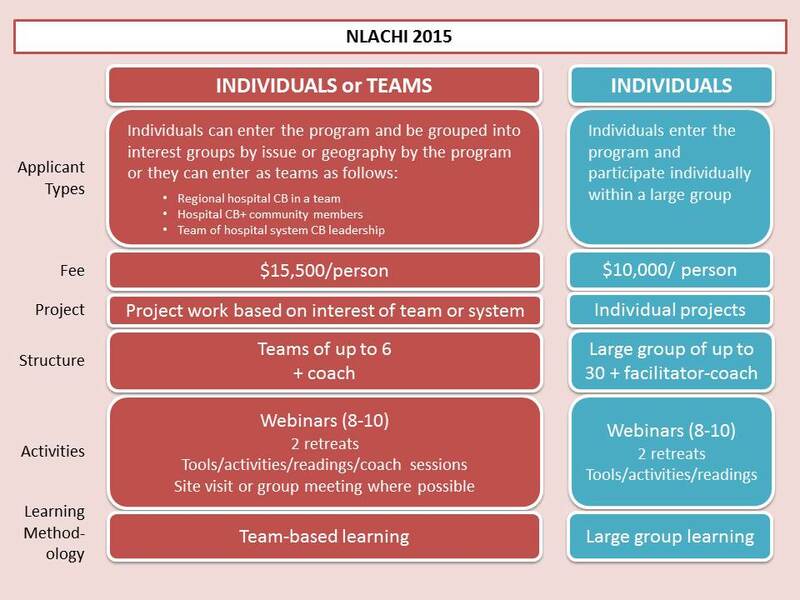 Coaching Support - Individuals that enter NLACI as a team will be assigned a coach soon after acceptance into the NLACHI program. Each team will be matched with a coach whose skills and experiences will most greatly benefit the team. Coaching support will occur through monthly phone call and two in-person meetings during the annual retreats (preceding the ACHI conference). The coaches will guide teams in applying concepts from the retreat, webinars, and activities to their leadership learning. Facilitator Support - Individuals that pick the large group learning experience will have a Facilitator/Coach to support their leadership learning. The facilitator will work with the large group during the annual retreats (preceding ACHI) on applying concepts from the retreats, webinars and activities. Peer Support and Network Building - All members will join an online learning community where they will be able to draw upon the expertise of the NLACHI community and crowdsource solutions to problems, shared successes, and engagement with a network of leadership experts. Leadership Learning Website - NLACHI has a robust online program portal of leadership articles and resources. All participants in the program will have access to the portal. Two two-day retreats held on-site and preceding the annual ACHI Meeting. Coach or facilitator support as described in the “options” section below. Leadership assessments that enhance both individual development and multi-sector collaborative experience and skills. Tools, activities, readings and case studies focusing on: building effective networks and partnerships; indicator and outcomes development; Continuous Quality Improvement as a strategy for building ownership and showing impact; effective messaging; and assessment of impact and reflection. Access to a website portal with resource library and archived program content. In addition to the program tuition, each participant is responsible for his/her own travel arrangements and all travel expenses. Upon receipt of the completed registration forms and letter, the Public Health Institute (PHI) will send an invoice to the host organization. Payment in full is due by September 21, 2015. A late payment fee of $150 is due if payment is received after September 21, 2015. Payments should be submitted by the participant’s organization in accordance with the instructions below. The Terms and Conditions as outlined below pertain to the Cohort of the NLACHI Program (October 2015 to March 2017). This section also includes general NLACHI Program Policies. NLACHI Program Commitment: NLACHI is responsible for providing NLACHI participants with all program elements listed above in the NLACHI Program Activities section. NLACHI Program Space Availability: NLACHI welcomes all eligible registrants. There are a limited number of slots available. Should registrations exceed space available, a reservation list will be maintained and those individuals waiting will be contacted for the next available Academy Cohort. In order to ensure that participants are as successful as possible in the program, participants should report any concerns they may have regarding program matters to NLACHI Program Directors as they arise. In order to maximize the learning opportunity for all members of the NLACHI cohort, NLACHI maintains highly professional standards and expects all participants to reflect these standards out of respect for others in the cohort. If any participant exhibits repeated disruptive behavior he/she may be asked to leave NLACHI. In this case, the host organization may request to substitute a replacement participant through the process outlined in the Cancellation Policy. In order to be eligible for a refund consistent with the Cancellation Policy, NLACHI must receive written notice from the host organization of the participant’s withdrawal including the reason for withdrawal. A host organization may request to transfer the participant’s spot to another individual for participation. The replacement participant should be the next most qualified person who has Community Benefit knowledge to carry on the work started by the original NLACHI Fellow from the same organization. The replacement participant and his/her host organization must submit this request in writing to NLACHI. Any substitution is subject to NLACHI’s approval. Quality Improvement - The use of a deliberate and defined improvement process, such as Plan-Do-Check-Act, which is focused on activities that are responsive to community needs and improving population health. It refers to a continuous and ongoing effort to achieve measurable improvements in the efficiency, effectiveness, performance, accountability, outcomes, and other indicators of quality in services or processes which achieve equity and improve the health of the community (Riley et al, “Defining Quality Improvement in Public Health”, JPHMP, 2010, 16(10), 5-7). Community Engagement - The process of working collaboratively with, and through, groups of people affiliated by geographic proximity, special interest, or similar situations to address issues affecting the well-being of those people. Health Equity - The absence of systematic disparities in health between social groups who have different levels of underlying social advantage/disadvantage (Braverman, P., Gruskin S. “Defining Health Equity J Epidemiol Community Health 2003;57:254-258 doi:10.1136/jech.57.4.254). Multi-Sector Collaboration - A collaboration between representatives of public, private, not-for-profit and community organizations. Systems Thinking - The approach that examines the interrelatedness of forces and sees them as part of a common process (Senge, Fifth Discipline). Download and complete one registration form per person. Compile all required supporting documents, which include: (a) one CV per person (b) one Job Description per person (c) one Letter of Committment from the Host Organization per person with required signature from sponsoring supervisor - It is essential that you utilize the available template below. Scan documents into two PDF files: (1) the completed registration form; and (2) all supporting documents combined into one PDF. Email two PDF files to info@healthleadership.org no later than 5:00 PM Pacific Daylight Time on 8/14/15. You will receive a confirmation email within 48 business hours. If you do not receive an email, please contact us. Please download and complete the Letter of Commitment from the Host Organization for the NLACHI 2015-2017 Session. Please also reference these IMPORTANT DIRECTIONS about how to download, fill in, save, and submit registration materials.